Posted by J Cole Morrison on January 25th, 2017 .
a) Docker is installed on your local machine and you are at least somewhat familiar with it. I'll still give you the commands and instructions. b) an AWS Account. If you don't have one, the first 12 months get you free usage in a LOT of areas. Well worth the value. Despite the efficiency of the command line, I'm also going to keep the guide extremely visual. 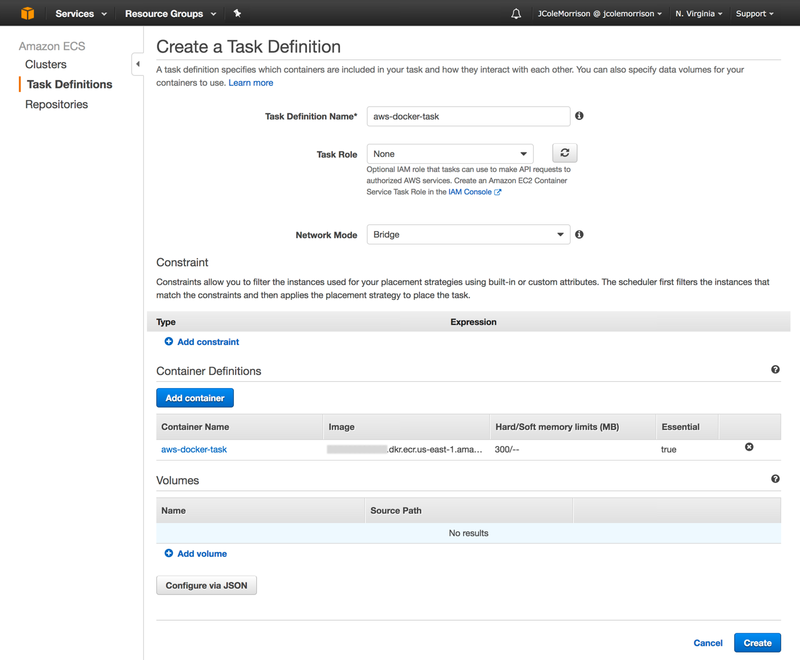 Lots of images of the AWS console, where to look for certain values etc. Even though ultimately much of day-to-day deployment of AWS docker style infrastructures will be purely automated - visual reinforcement of these concepts and steps will help us LEARN and UNDERSTAND. Once you're able to tag a service/workflow to the UI, scripting with the CLI will be that much easier. Unless you're starting from the last tutorial. Regardless, of which approach taken, make sure you're in the code directory you created. $ git clone git@github.com:jcolemorrison/cra-storybook-sass-yarn.git . You'll need to make sure you have a Docker account and are signed up to hub.docker.com so that you can pull images from the Docker Hub. I'll be specific, but whenever I reference the app directory for those using approaches (a) and (b) from above, just remember those using the straight create-react-app need to do it directly in the code directory. # Match T2 1 core with Worker Limit AND the open rlimit file. This is our base Nginx configuration file. More specifics are in the comments, but we won't spend any specific time on this since there is a TON to cover. # Try to load the favicon or fall back to status code 204. Notes about what's happening in the Dockerfile are in the comments. Again, while I'd love to stop and explain each line, there are a plethora of resources on it and we still have MUCH to do. I see that the code syntax highlights makes much of the above code example look like comments, but it's not. Copy and use that entire code block. # Exit the script as soon as something fails. This is simply for future usage if we desire to comeback and modify and/or perform more operations when the Docker Image build is complete. This is particularly useful for automate deploys and continuous integration testing. We won't be doing anything beyond this though for this guide. Only note to point out is that the !/usr/bin/env bash gives us a very reliable way of hooking into Bash. 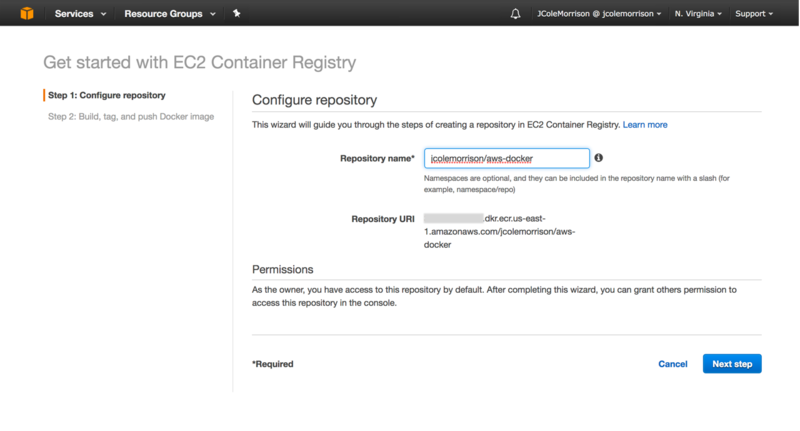 Next up is getting our Docker image up into AWS's EC2 Container Registry. While we could use Docker Hub, ECR comes with all of the usual benefits of using other AWS services with other AWS services. After that we'll also set up our ECS Cluster. This executes the statement AWS gave us and logs is in with the Docker CLI. Now we can push images to ECR. Remember, you must have the AWS CLI AND Docker installed on your local machine to do any of this. docker build -t yourusername/aws-docker . This is actually the second command AWS ECR wanted us to run. This tags the image we just built as latest and also tags it with our ECR account which will allow docker push to send it up to ECR. Run it. This will actually push the docker image UP to our newly created ECR repository. Click on Done on the success screen. ... Let's quickly summarize ECS in a nut shell, so that we're not blindly operating in the dark. A Task Definition is just a set of "instructions" that specifies how to create a docker container(s), how to launch it and with what parameters/resources from AWS. These "instructions" always consist of a Docker Image, but also a number of other things like required CPU, Memory, Environment Variables, etc. But they're just that. 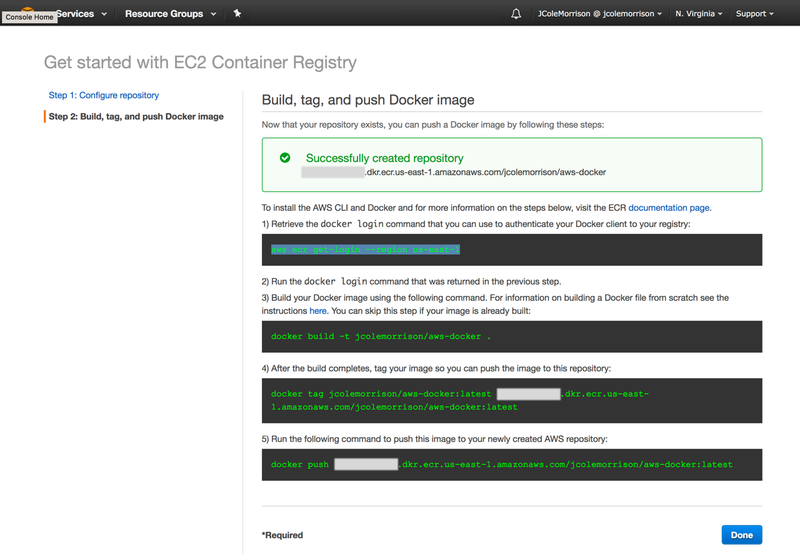 Just, how to make a docker container out of a docker image in context of AWS ECS. Task Definitions can also define more than one container. So we may have a "web task definition" that consists of a Node.js docker container that references and depends on a MySQL docker container. A Service is just manages a Task Definition in context of our cluster. We give it a Task Definition and it finds the appropriate space for it within the servers we have launched into our cluster. Additionally it can be paired with a load balancer to keep any one Task (an instance of a Task Definition) from getting over loaded. Container Instances !! Are not instances of docker images. 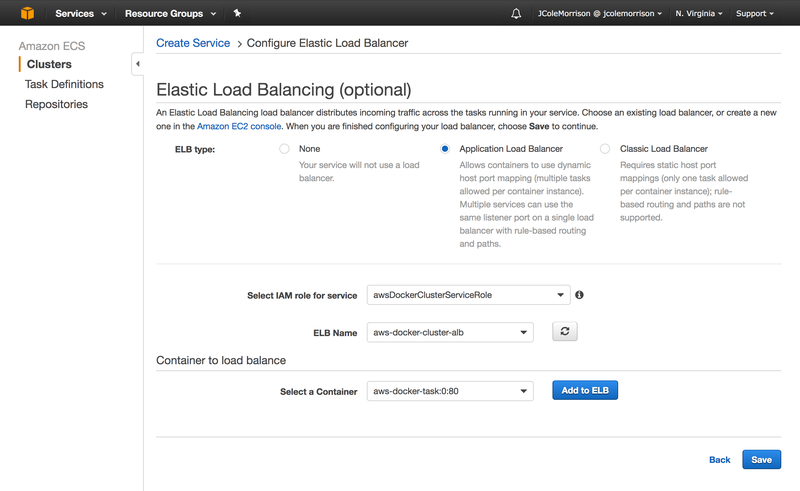 They're just EC2 Instances that are specified to launch into our ECS Cluster. Our cluster, instead of completely viewing our instances as separate servers, instead looks at the total CPU and Memory available and makes a lot decisions for scaling based on that. Finally our Cluster is just the "club" for all of the above. We give a number of EC2 Instances. It views them as aggregate computing power, think of it like turning multiple instances into one big instance. We define Task Definitions out of our desired Docker Images. We create a Service, hand it our Task Definition and tell it that we want X number of "Tasks" from this Task Definition. It looks through all of our Container Instances, identifies which of them have the computing power to handle our Tasks, and launches them into it. Even though the members of the "club" did the work, we still say the "club" did it. "I have an nginx web server on a t2.micro. But it's only taking up 128 of the 1024 cpu and 300 of the memory"
"I have a Node API Server on a t2.micro. But it's only taking up 200 of the 1024 cpu and 600 of the memory"
"I have a MySQL on another t2.micro. And it's taking up 500 cpu and 1000 memory"
We have 3 instances running. Yes there's ways to finagle EC2 to let us put them together and what not. But why not just use ECS? It's free. You only pay for EC2 instances, just like you do in this aforementioned scenario. "I have 3 Task Definitions, an Nginx One, an API one and a MySQL one"
"My Cluster has 2000 cpu and 1990 memory available"
caveat being that t2's operate in bursts but we're just going with averages here. After it's complete, click View Cluster to see it up! 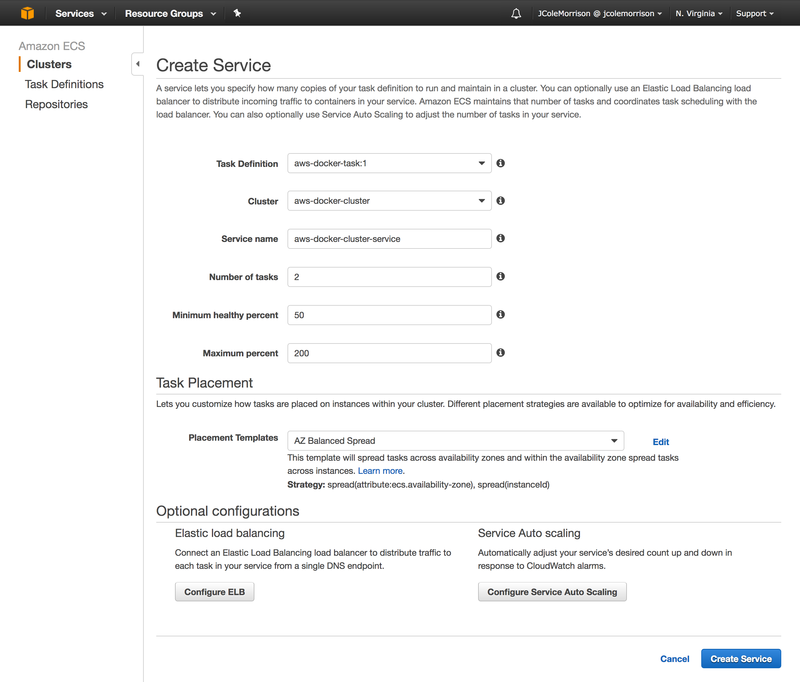 Before we move on, we need to setup all of our Identity and Access Roles that will allow our EC2 instances to interact with and join our ECS cluster and ALSO our ECS Services to manage our Task Definitions in context of a Load Balancer. A group is just a logical grouping of users. Instead of attaching a set of permissions (policy) to each user, you can instead attach a set of permissions to a group and then declare users as part of the group. They will then be restricted to that group's permissions. 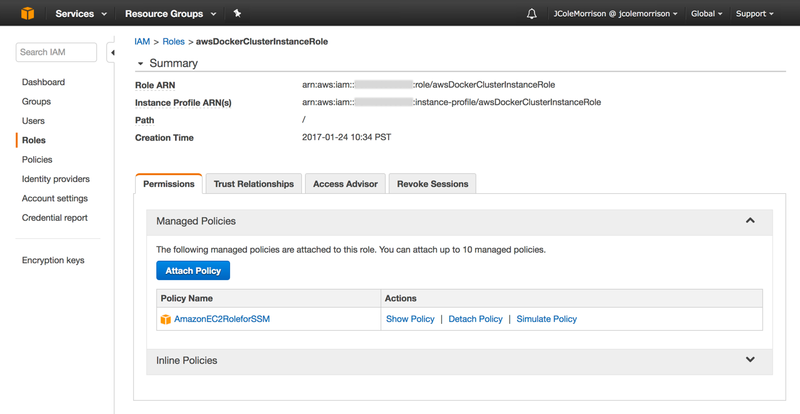 24) Click the role we just created - awsDockerClusterInstanceRole and it will take us to its summary screen. Excellent. Now one more role to go. 26) Click on Roles the side left navigation and then click Create New Role again. In Step 5 - Review it and click Create Role. The next layer of security we'll hit is Security Groups. Again this is its own beast so I'm not going to go deeply into it. But all they do is, in a very simplified and boiled down summary, is permit certain traffic to make it to your instances and containers. As an analogy, think of your instances like buildings. Security Groups are like a security team that only allow certain persons into the buildings. They assume once someone is in though, that they're allowed to leave (known as a STATEFUL - return traffic is allowed). However, to complete this analogy, we need to add one more concept. Security Groups are actually more like Security Companies that buildings (our instances) can pick to guard them. If multiple buildings (instances) belong to the same Security Company (security group), they are allowed to access each other. Security Companies (security groups) can also clients of other Security Companies access to their clients. The last sentence there is a bit odd. But as an example, suppose I have a set of instances Group A that use Security Group A, and also a set of instances Group B that use Security Group B. If Security Group A says that Security Group B is permitted access, then all instances in Group B can access instances in Group A. Of course, this is just the close layer of security to the instance.. however it's surprisingly pretty effective. Also, I'll be releasing a video series in the next couple months that covers VPC's in context of production application deploys in detail, but for this tutorial, we're going to just keep it simple. We're going to be creating 2 security groups. One to only allow in HTTP traffic into our Application Load Balancer. Another to only allow traffic from our Load Balancer into our Container Instances. 31) One more thing, for easy hover of the Name cell for your aws-docker-alb and a pencil will show up. Click it and give it the name tag of aws-docker-alb-sg. Not necessary, but nice. Also, copy to your clipboard the Group ID of this security group that we just created. Where the sg-49399735 is the Group ID of your aws-docker-alb security group we just created. You'll now have two security groups. One for the load balancer we'll create and one for all the instances that contain our docker containers. From our earlier big overview of ECS Clusters, we talked about the idea of Container Instances. Despite the mind leading to "Oh an instance of an image is maybe what they mean", we know that it's actually just an EC2 Instance that belongs to an ECS Cluster. Now, why don't we just spin up instances manually and throw them in? Well, if one our manual instances fails, there's nothing that's going to put it back into service. Additionally, what if we want to add more? Take away some? This is where we leverage Launch Configurations and Auto Scaling Groups. 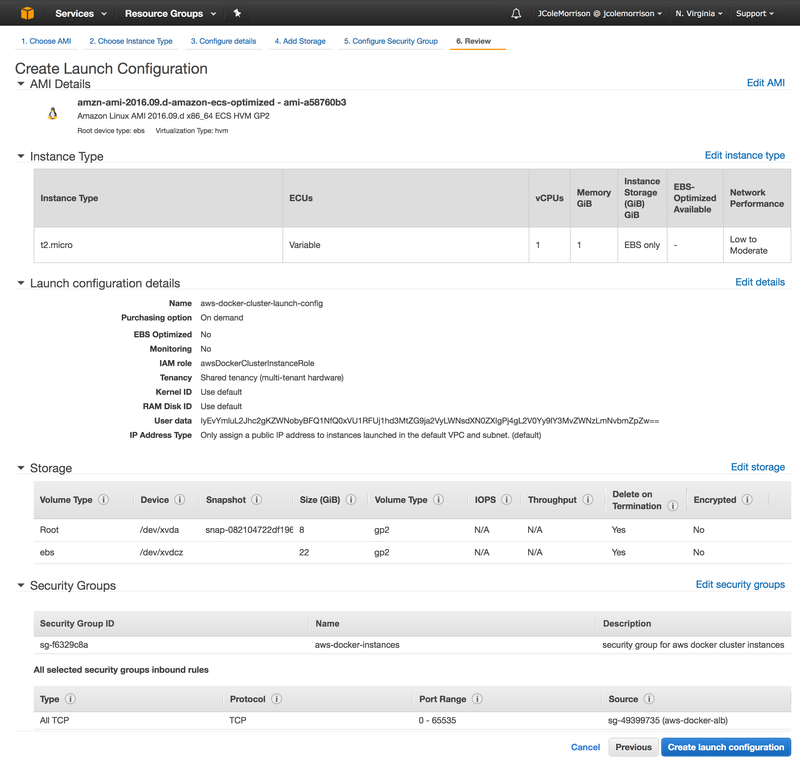 Launch Configurations are just a set of parameters that define an EC2 Instance. We pick a base Amazon Machine Image, the type and power of an instance (i.e. t2, i2, m3, etc), storage types, vpc settings, etc. just like we do when creating a stand alone EC2 instance. However, instead of it spinning up an instance, it defines a set of instructions to create instances from. 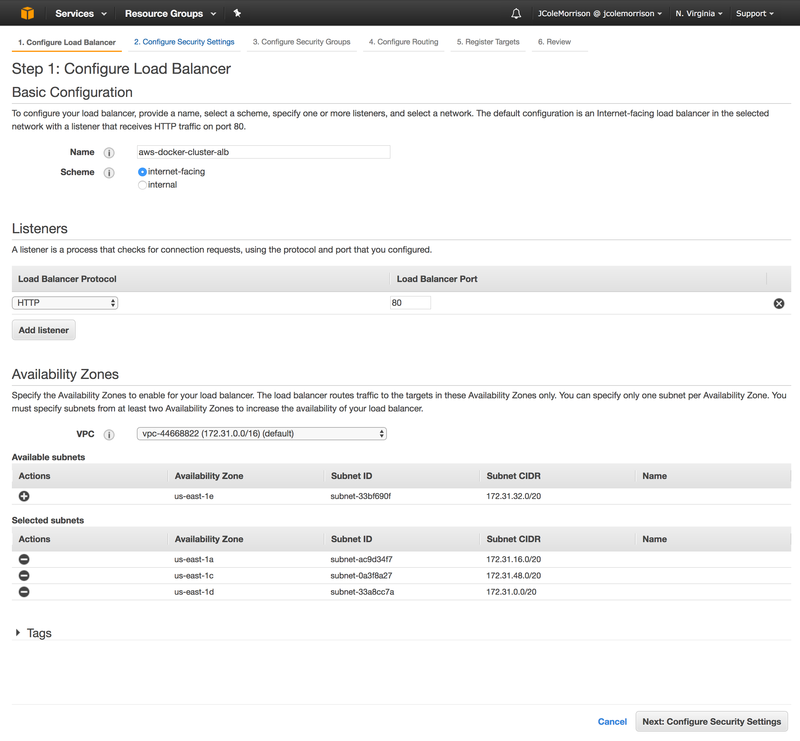 Auto Scaling Groups use Launch Configurations and keep and scale a set of EC2 instances that are created from a provided Launch Configuration. For example, we may have a Launch Configuration that uses an Ubuntu Image and an M3 general purpose instance type that launches into a particular network. If we tell our Auto Scaling Group to always have 3 of these available, than even if one fails, it will automatically spin up one with identical settings. Additionally, Auto Scaling Groups can be used to scale up and down the number of instances based on defined parameters such as CPU reservations/utilization, particular date/time events and more. We won't dive into that in this guide since it would involve us diving into CloudWatch as well. Once you click that IF you've never created a Launch Configuration, AGAIN, it'll show a little splash screen about Auto Scaling Groups. Just click Create Launch Configuration in the bottom Right. Oddly enough they have them under Community AMIs which isn't immediately obvious, especially since the marketplace has another official ECS AMI. Bottom line is that you'll always look for the AMI referenced in the above link. Click Select the first option. If it doesn't look like the one in the picture above, just make sure to select the one with the ACTUAL AMI ID, not ones that support it. T2 types are amazing. Burstable performance with baseline guaranteed performance. Even though T2.micro tends to be what gets used in tutorials don't under estimate the power of this instance family type. Sure, if you need consistent performance, one of the other types is great, but most web operate in surges of traffic fit this type amazingly. The above is essentially a launch script. When an instance launches, it'll run the above script. What this is doing is specific to our ECS Optimized image, and puts our cluster's name into the ecs config file so that it knows to join that cluster as a Container Instance. 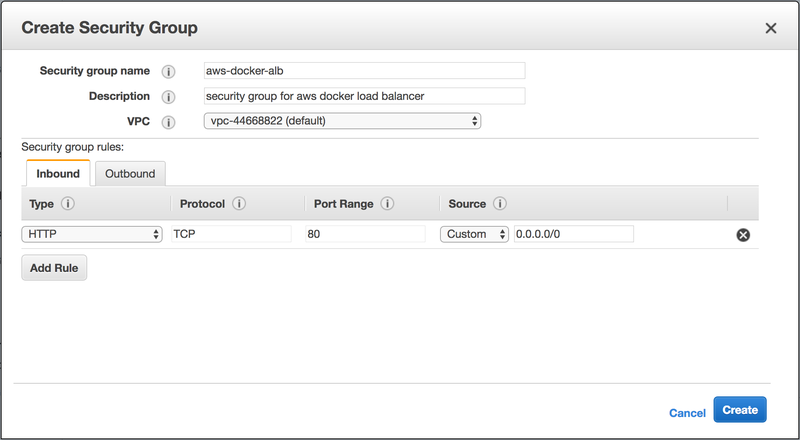 39) Click Select an existing security group and select our aws-docker-instances security group that we created. Click Review selecting the security group. 40) Review all the Launch Configuration and make sure its inline with all of the steps above. Obviously some values will be different since Security groups, ebs volumes, etc have unique IDSs. Click Create launch configuration in the bottom right when ready. 41) Once you click Create launch configuration it will pop up a dialog about using an existing or creating a keypair. 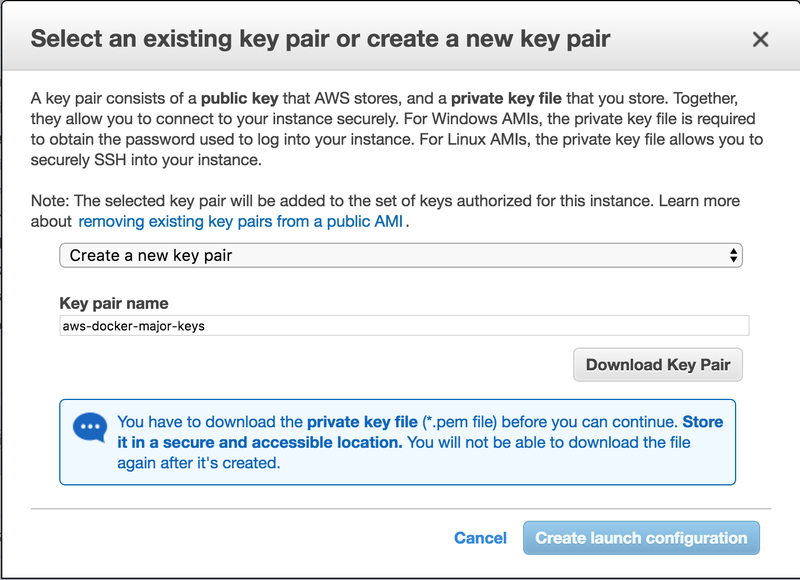 When creating EC2 Instances or Launch Configurations, AWS will prompt with the ability to use an Key Pair to access your instances directly via SSH. The benefits of this are obviously management, direct logs, troubleshooting etc. We're going to go ahead and generate one, but we won't be diving directly into any of our instances in this tutorial. Keep it secret. Keep it safe. After all it's a major key. 42) Once you've clicked the Download Key Pair the Create launch configuration button will enable. Click that to create it. Selecting the different subnets makes it so that our Auto Scaling Group will launch instances into different Availability Zones. Since our service will then be available in different "AZs", if one goes down, we still have another one up. Spreading our service across multiple AZs is a major key to fault tolerance. As mentioned earlier, we won't dive into scaling up and down. However, this option will make it so that our Auto Scaling group keeps our instance numbers at 2. If one of them fails for any reason, it will spin a new one right back up. 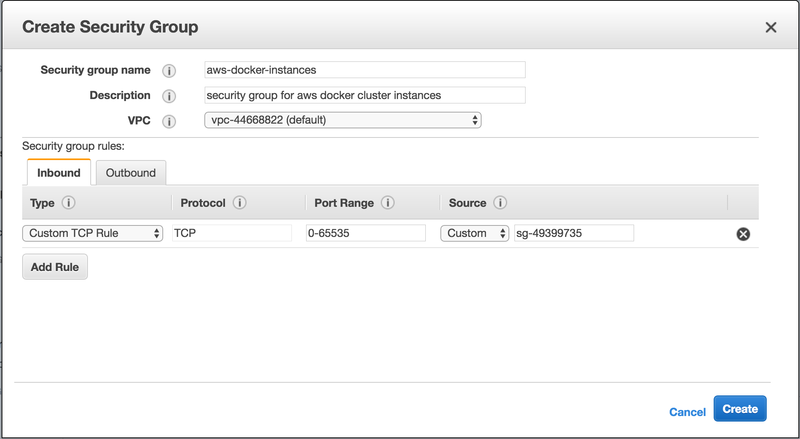 46) For the first row, make the key Name and give it the value of AWS Docker Cluster Instance. Leave Tag New Instances checked. The Name tag is actually a special tag that gets used by AWS in a lot of things. In this case, it specifies what our Container Instances will be tagged as when they're created. 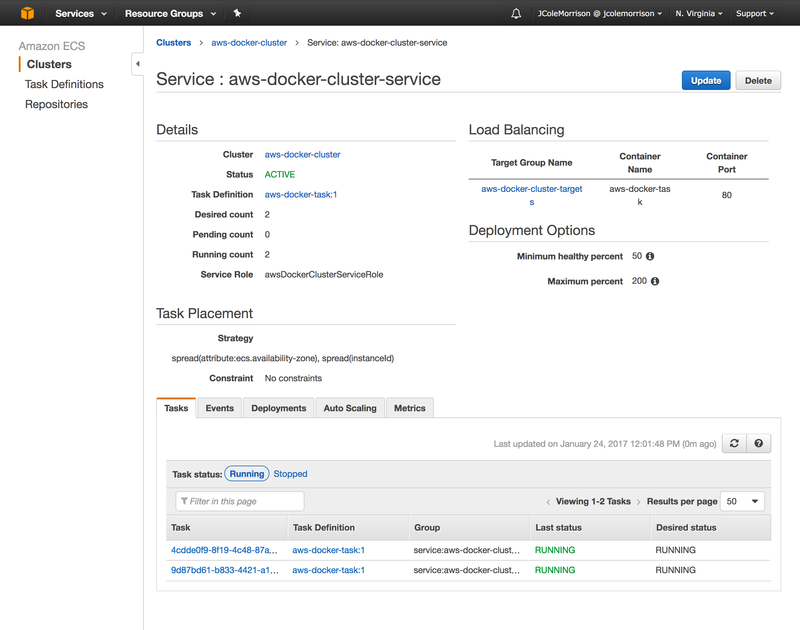 48) With your auto scaling group aws-docker-cluster-scaling-group selected, click on the instances tab in the bottom panel to see the status of your instances. The word Load Balancer is pretty self explanatory. Elastic Load Balancers, both Classic and Application, deal with spreading traffic across different instances and availability zones. They routinely check the health of all instances they load balance to in order to ensure that traffic can still be sent. If an instance repeatedly fails a health check, the Load Balancer will direct traffic away from the unhealthy instance to a healthy one. The difference here is that we'll be using the newer version known as the Application Load Balancer. This gives us an additional HUGE benefit when working with AWS ECS. Instead of just being able to spread traffic across instances, we also spread it across our Tasks (remember, instantiations of Task Definitions) within instances. For example, if you have 6 Tasks spread across 3 instances, the Application Load Balancer will work with our Services and Cluster to balance traffic between all 6 Tasks. There's many other benefits as well, such as being able to name space tasks in a particular cluster based on endpoint. For example, you can have a group of Tasks that serve web page A behind a route called /a and another group of Tasks that serve web page B behind a route called /b. This isn't currently possible with Classic Load Balancers. One last random tidbit, since every application I see from others talks about how they'll use HTTP/2. Application Load Balancers hook this right up as long as you've got SSL set up on them. We won't do this in this tutorial, but they make it incredibly easy. Click Next: Register Targets in the bottom right. 56) On Register Targets, Leave it as is. AWS ECS Clusters manage and register our targets for us (and we set them up there). Load Balancers can sometimes take a bit to get up and running. By a bit I only mean anywhere from a few minutes to 10ish minutes. Until then, their state will be in Provisioning. The Load balancer won't be able to take traffic until it hits active. We can continue on though. Just know if you speed through the rest of the steps and complete them before the Load Balancer is up, you'll still have to wait until it's active. Now that our ECS Cluster has EC2 instances launched within it (now known as Container Instances), we can provide it with Services of Task Definitions to launch Tasks of our aws-docker image across our Container Instances. And yes, I am also perplexed as to why AWS chose such general names. 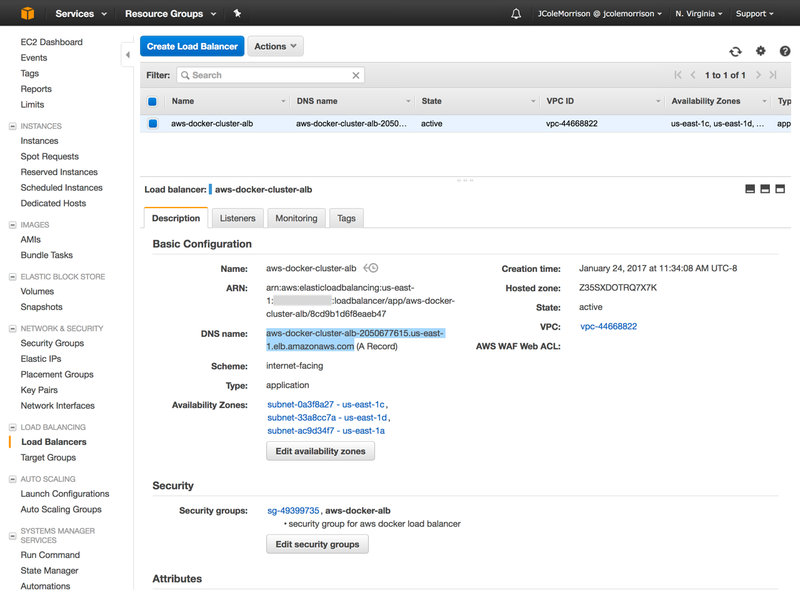 59) Click on Clusters and then click on our aws-docker-cluster cluster. 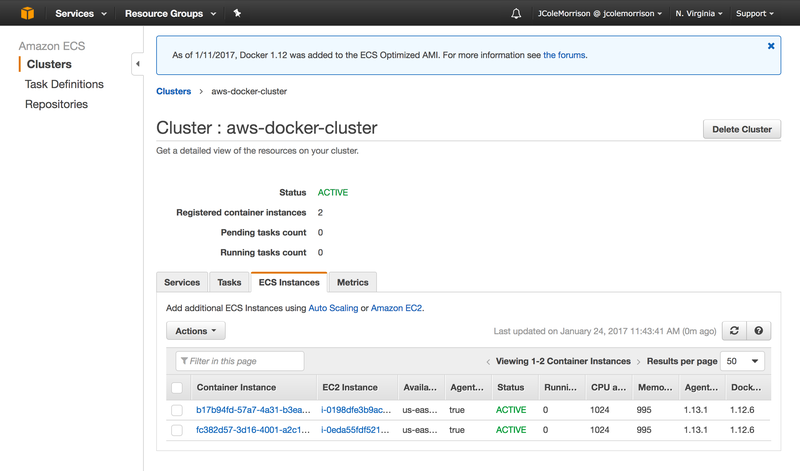 In here click on the ECS Instances tab and we'll see that our aws-docker-cluster has registered the two ec2 instances from our auto scaling group. 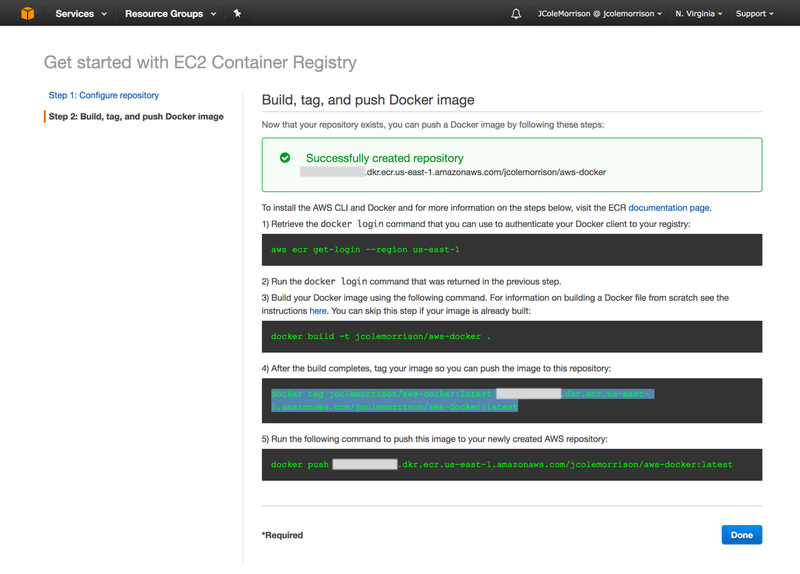 60) Now click on Repositories in the side left navigation and click on our image repository we created username/aws-docker. In here grab the Repository URI of your image at the top of the repository page. Copy it or remember it, etc. We need this value to tell our Task Definition which image to use when creating containers. This is an alternative to filling it in via the user interface above. We won't deep dive into the specifics of a Task Definition due to the sheer amount there is and how much cross over there is with general Docker knowledge. For example, CPU and Memory usage aren't some special AWS Docker thing, instead those are actual values you use in normal Docker container definitions. The one thing I will mention is CPU and Memory usage. There are two types, hard limits and soft limits. Hard limits are how much your container can use and will never go above. Soft limits are what it will try and stay at, but will fluctuate if resources allow. Generally both are preferable, however, our app Task is only managing one container, so it's not as important. d) the auto scaling policies (if any) and their thresholds on memory and cpu utilization / reservation. 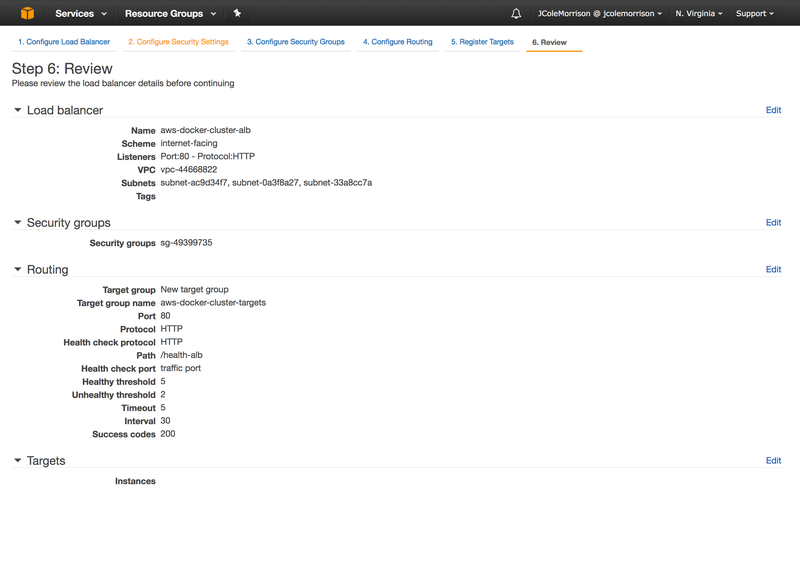 62) Click on clusters in the side left navigation and then click on our aws-docker-cluster cluster. The first 4 of these params should be straight forward. The Healthy Percents are just how much the cluster will try and keep it's number to tasks to. The Max percent is mainly there so that if it needs to kill an old task (say you've updated your task definition), it's allowed to launch new ones and kill the old one afterwards. The Placement Templates are how it will spread traffic across your different tasks. Keeping traffic across AZs again helps performance and fault tolerance. Do not click create yet. We still need to setup the load balancer. This is how and where we're going to hook up the load balancer we created to our aws-docker Tasks running in our Cluster. don't click save yet though. Click Save. This will take us back to the Create Service page. 69) The Launch Status screen will come up. Once it's complete, click View Service. We should see our services running! Finally, let's confirm that our services are actually up and running on the world wide web. 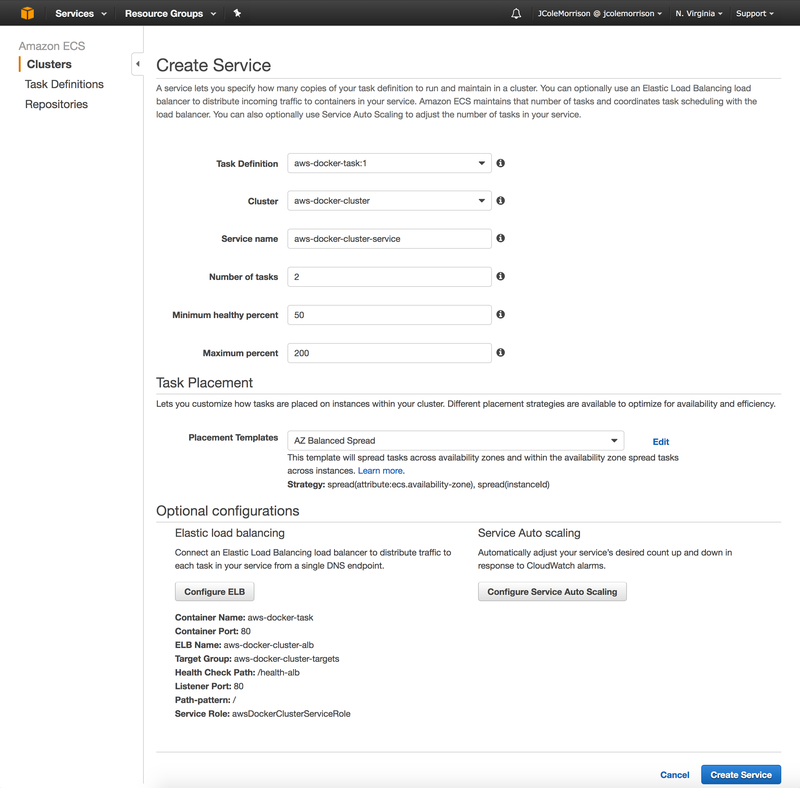 70) Head back to the main page (aws logo in top left) and then click on EC2. Click on Load Balancers on the left side navigation. 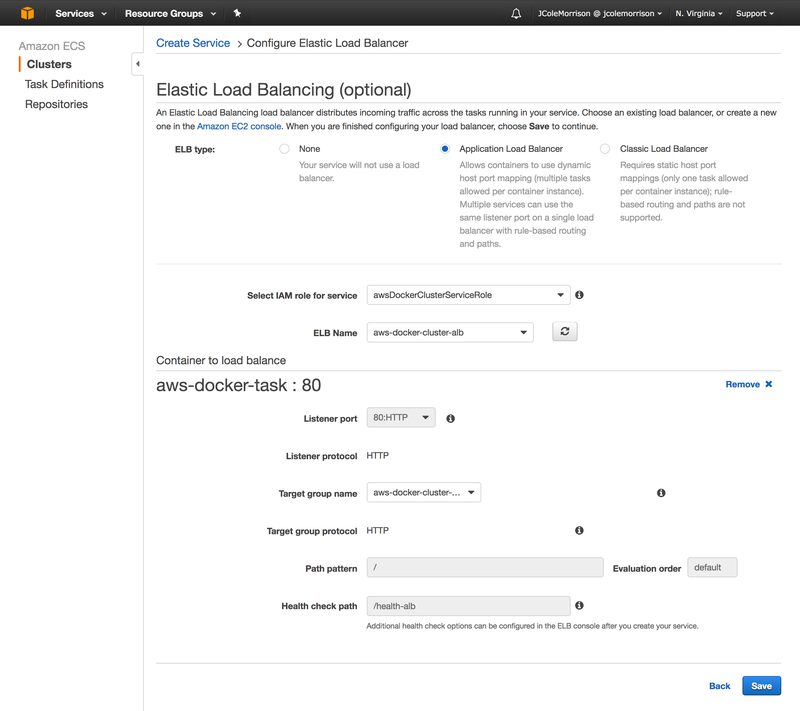 Paste it into your browser and BOOM your AWS Docker app is now fault tolerant and load balanced on AWS. Give it a few minutes. As the instance shuts down and is terminated: (a) our load balancer will only direct traffic to the working instance and (b) our auto scaler will detect the drop in live instance and spin up a new one! Ehhh, at this point I should probably stop typing. The point being that you can use this as a blueprint and starting point to production level architectures and extend it to your needs. The MAIN component missing though is a production ready Virtual Private Cloud as I mentioned earlier in the tutorial. This really is a critical part to security and segmenting AWS resources. We also probably want a continuous integration and continuous deploy pipeline setup for developers so that pushing updates is seamless. If that's of interest feel free to hit me up on twitter or email and I'll make sure to let you know when it's complete. Be sure to follow for weekly updates!